In this document we will be talking about how to monitor Docker ( https://www.docker.com/ ) with Mackerel. In order to understand Docker container's resource consumption, we will refer to the statistical data of the resource that Docker is using. The statistical data of Docker’s resource is obtained using the API (https://docs.docker.com/engine/reference/api/docker_remote_api/ ). Metrics can also be gathered through the cgroup’s file system for backward compatibility, but this way is deprecated. For technical details please refer to the official documentation (https://docs.docker.com/articles/runmetrics/). 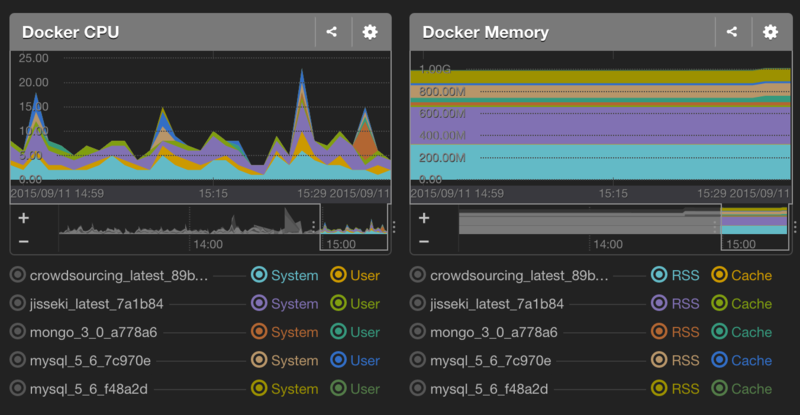 Using mackerel-plugin-docker you can acquire cgroup statistics and have them graphed in Mackerel as custom metrics graphs. mackerel-plugin-docker is included in the official plugin pack so let’s go ahead and install that first. For a more specific description of this procedure please refer to Using the official plugin pack to visualize middleware metrics. Once the official plugin pack has finished installing we will append the following configuration to /etc/mackerel-agent/mackerel-agent.conf. By doing this, the CPU%, memory consumption, IO usage (IOPS, bytes transferred and queue length) of the Docker container running on that host will be graphed. When starting up the container anew, an entry will automatically be appended to the graph. If you close the container, that entry will automatically become unviewable after a few hours. If label is configured, you can choose which key to use in the -label option. Additionally, in -method option, the metric information can also be collected through the file system and not the API. In that case, configure with -method File. However, be aware that it is deprecated. We’re offering mackerel-agent’s Docker image which you can access with the link below. By using this it’s possible to start up the mackerel-agent as a container and monitor hosts and other containers as shown in the diagram below. To start up a container from the mackerel-agent image, we will execute the following command. <APIKEY> will be replaced with the API key of the affiliated organization. enable_docker_plugin is a flag to set whether or not mackerel-plugin-docker should be used. auto_retirement is a flag to set whether or not the server from Mackerel should automatically retire when the container is closed, though the default setting is “off”. opts is the parameter transferred to mackerel-agent. --name is the container name. Please update these options as necessary. To monitor the processes of other containers we will use Docker’s link option. By using the link option we can obtain other containers’ IP addresses and port numbers through environment variables. The prefix of each environment variable will be <name>_PORT_<port>_<protocol> and so by appending ADDR, PORT, or PROTO to the prefix, the IP address, port number, and protocol can be obtained (e.g. prefix_ADDR, prefix_PORT, prefix_PROTO). Here we will show an example with memcached. First we will start up the memcached container with the name memcached. Next we will prepare the settings file of Mackerel’s memcached plugin. This file will be kept on the host side. Through Docker’s link option, we can obtain the container’s IP address with the MEMCACHED_PORT_11211_TCP_ADDR environment variable. Lastly we will start up the mackerel-agent container that was linked to this memcached container. Here we’ll use the -v option and include and the settings file from above will be read. With this you will be able to start up the mackerel-agent container that will monitor the memcached container.